He went on to note that foreign relations were improved and internal taxes discontinued. He said that import taxes, “paid cheerfully by those who can afford to add foreign luxuries to domestic comforts,” supported a smaller national government, allowed for the expansion of the nation through the purchase of Louisiana and Indian territories, and reduced the national debt. Jefferson did not, however, forgo the partisan opportunity to remind the public that “the acquisition of Louisiana has been disapproved by some.” Most Federalists had openly opposed the purchase. Based primarily in New England and determined to protect that region’s trade and shipping interests, the Federalists were uneasy with the country’s westward movement and the growing importance of the port of New Orleans. 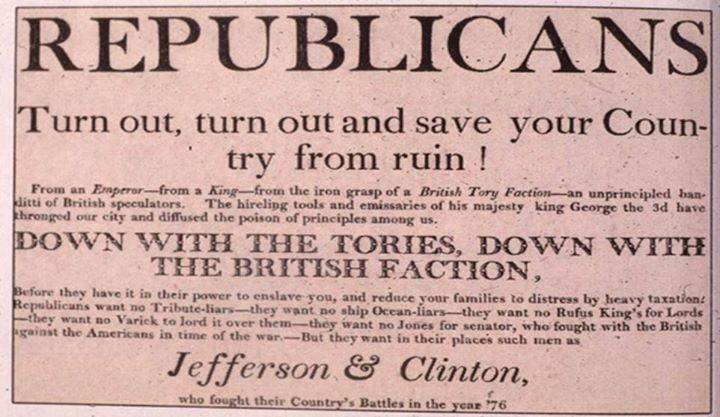 But to Jefferson, the 1804 election victory sounded the approval of his western vision by the majority of Americans. The achievements of Jefferson’s first term had assured that he would be re-nominated by his party. But the Republican caucus, which met in February 1804, had dropped the Vice President Aaron Burr in favor of New York’s governor, George Clinton, as Jefferson’s running mate. Burr had lost the confidence of many Republicans during the drawn-out election of 1800. In that contest, Jefferson, then vice president, defeated the Federalist incumbent, John Adams. But because the Republicans had failed to make sure at least one electoral vote for vice presidential candidate Burr was withheld, Jefferson and Burr tied for the presidency. The contest went to the House of Representatives, where Federalists seized the opportunity to block Jefferson’s election by giving their votes to Burr. The deadlock was not broken until mid-February 1801, when the House elected Jefferson on its 36th ballot. Because Burr did not withdraw his name from contention for the presidency, Jefferson and other Republicans came to doubt his loyalty and were uneasy with his holding a position of national prominence. As Jefferson began organizing his administration, he ignored Burr’s patronage recommendations and did not consult him on policy decisions. As any change to the Constitution required ratification by three-fourths of the states, Jefferson and Secretary of State James Madison left Washington for the summer recess with the electoral process still undecided. Madison assured Jefferson that all was ready “for giving effect to the proposed amendment.” But it was not until Sept. 25, 1804, that Madison was able to declare that the 12th Amendment to the Constitution had been ratified. In keeping with the practice of the time, Jefferson and his Federalist rival, Charles Cotesworth Pinckney of South Carolina (who had been Adams’ running mate in 1800), abstained from any overt campaigning. Both relied instead upon their party machinery working at the grassroots level and through the press. The strongest opposition to Jefferson was based in New England. 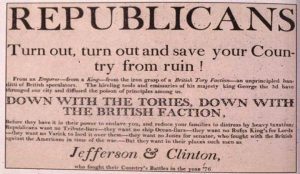 Federalist William Plumer of New Hampshire lamented that Jefferson and his supporters were even allowed to call themselves “republican,” believing “Democrats and Jacobins” far more appropriate. Plumer authored six newspaper articles under the pseudonym Cato in which he went through Jefferson’s political career from secretary of state to the presidency and even referenced Jefferson’s one published book, Notes on the State of Virginia, to outline what he saw as Jefferson’s inconsistencies. Despite these efforts, Plumer had to record in his personal journal entry for Feb. 13, 1805, his party’s overwhelming loss. When the electoral ballots were counted that day before a joint session of Congress, Jefferson and Clinton received 162 votes apiece while Pinckney and his running mate, Rufus King of New York, had 14 apiece. It was none other than Aaron Burr, sitting as presiding officer of the Senate, who declared that Thomas Jefferson had been elected president and George Clinton vice president. Originally published by The Thomas Jefferson Foundation, republished for educational, non-commercial purposes.